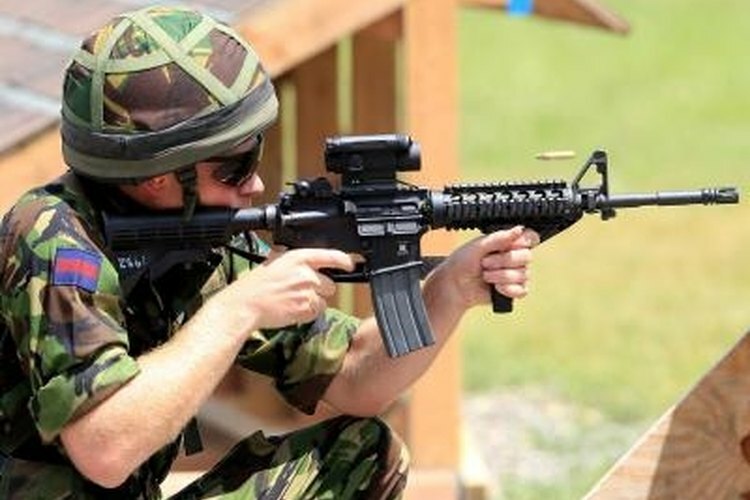 The M4 carbine is sometimes fired from the kneeling position. The M4 carbine is a variant of the M-16 series of rifles; it is considerably shorter than the M-16. This shorter length requires exact zeroing to ensure proper accuracy. The zeroing process involves sighting the rifle to mechanical zero. This means the rifle's sights are properly aligned on the rifle. The rife must also be zeroed to the shooter. This properly aligns the sights to an individual. Move the front sight-post up or down. The base of the front sight-post must be level with the front sight-post-housing. Lower the front sight-post by turning it clockwise. Turn the elevation wheel on the rear sight-assembly counterclockwise. Align the "6/3" mark on the elevation wheel with the index mark on the carrying handle. Flip the rear site so the unmarked aperture is up, and the "0-200" aperture is down. Rotate the windage knob. This aligns the center mark on the "0-200" aperture with the center index-line on the rear sight-assembly. Load the weapon with five rounds. Set a zero target 25 meters from the firing line. Fire five rounds of ammunition at the center of the zero target. Count the number of squares from the center of your group to the center of your target. Note the number up or down, and the number left or right. Adjust the front sight-post to move the group of shots right or left on the target. Adjust the elevation knob on the rear sight-assembly to raise or lower the group of shots on the target. Shoot from the prone position for the best accuracy. Always wear hearing and eye protection when shooting. Never handle a weapon until you are certain it is safe and clear. Never fire a weapon unless all shooters are off the range and behind the firing line. Never walk forward of the firing line unless all firing has stopped.